On 14 March 2009 The Church of Jesus Christ of Latter-day Saints held a groundbreaking ceremony for the Quetzaltenango Guatemala Temple. The intention to build the temple was announced on 16 December 2006, and the completion date will be in 2011. This will be the second temple in Guatemala, with the first being the Guatemala City Guatemala Temple. Church members have been willing to travel great distances to attend a temple, and having a temple in closer proximity is a reward of their faith. Quetzaltenango (Xela) is Guatemala's second largest city located 128 miles northwest of Guatemala City—the largest city—in a large valley surrounded by mountains and two volcanoes. The temple will be situated on a hill in the western part of the city. The exact location of the temple is at 9a. calle 4-03, zona 9, in front of the Residenciales Los Cerezos 1. The Quetzaltenango Guatemala Temple opened its doors for an open house prior to its dedication on November 11, 2011 through November 26, 2011. The formal dedication of the temple took place on Sunday, 11 December 2011, in three sessions by President Dieter F. Uchtdorf of the First Presidency. The dedicatory sessions were broadcast to congregations of the Church within the temple district. On Saturday, December 10, 2011, youth performers from area congregations danced, sang and presented a visual display of local history and culture. 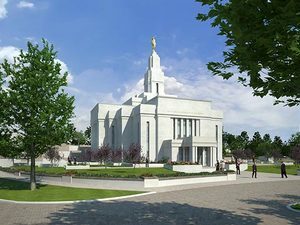 The Quetzaltenango Guatemala Temple will be the Church's fifth in Central America (and the 136th Mormon temple worldwide), and will serve approximately 60,000 Latter-day Saints. LDS Missionary work in Guatemala began in 1947. By 1966 there were 10,000 Latter-day Saints in the country. When the Guatemala City Temple (the country's first temple) was dedicated in 1984, membership had risen to 40,000. By 1998 membership had quadrupled again to 164,000. In 2006, leaders of the Church announced a temple in Quetzaltenango. Today, Guatemala has more than 226,000 Latter-day Saints spread through more than 400 congregations in the country. This page was last edited on 14 December 2011, at 01:00.